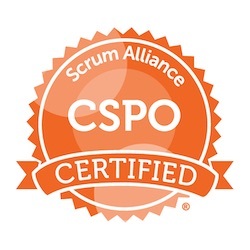 The CSPO training focuses on the perspective of those who want something delivered from Scrum teams. You learn how to be an effective Product Owner. This course is also very suitable if you are a stakeholder of one or more Scrum teams. For example, if you are a customer of a supplier who uses Scrum. Or if you are a business stakeholder of Scrum teams in your own organization. The focus of the training is on delivering value to stakeholders in small steps, based on vision and objectives. Even in an environment that works less Agile. Various Agile strategies and facilitation techniques are taught and practiced for this. To obtain the CSPO certificate, two days of active participation in this training are required. Immediately after the training you will receive your Scrum Alliance certificate online. No exam needs to be done.